With the explosion of mobile smartphones and tablet PCs in the office, Xerox has stepped up to the plate with a new cloud-based Mobile Device Management (MDM) service. MDM is designed to enable companies to track and secure these mobile devices, so that, for instance, if lost, they become unusable, thus protecting confidential data stored on them. Xerox’s Ken Stephens, senior vice president of cloud services at Xerox, says MDM can be adapted to manage virtually every type of mobile device. It’s designed to eliminate complicated technical implementation and oversight, as well as hardware and software costs. The new service will enable companies, no matter their size, to identify, secure, and track mobile devices such as smartphones, tablet PCs, and laptop PCs. MDM includes set-up and administration, plus IT staff training to help companies see, track, and secure any mobile device. It also makes sure devices can be locked and unusable, and even remotely formatted. Alan Snyder, who is CEO at BoxTone, a Xerox partner, noted, “The Xerox business cloud includes a mobile management approach that delivers the critical components for device management: security, ease-of-use and administration, and a price point that’s more than reasonable.” Xerox’s cloud services include Boxtone’s automated technology for enterprise mobile management and mobile device management for the Apple iPhone and iPad, as well as for Android and BlackBerry devices and applications. Epson America have introduced its next generation 64-inch solvent printer – the EPSON® SureColor™ S30670. Incorporating Epson's latest technological breakthroughs, the SureColor S30670 is the first ever solvent-based printer to use the EPSON MicroPiezo® TFP® print head, bringing a new level of quality, performance and value to the signage, vehicle graphics and fine art markets. "Our first generation solvent printer – the EPSON Stylus® Pro GS6000 – has been a game changer in the signage market over the last four years, bringing advanced image quality and an ink technology with less impact on the environment to the industry to open up a new range of applications for solvent printing," said Reed Hecht, product manager, Professional Imaging, Epson America, Inc. "The new SureColor S30670 offers advancements in print head and ink technology to deliver higher quality printing, faster and better, at an extreme overall value." The SureColor S30670 utilizes an entirely new print engine featuring Epson's MicroPiezo TFP print head to deliver droplet sizes as small as 4.2 picoliters and double the nozzle density of Epson's previous solvent printer for extremely fast print speeds. The SureColor S30670 is a four-color solvent printer (CMYK) leveraging new EPSON UltraChrome® GS2 solvent-based ink technology. Developed exclusively by Epson, UltraChrome GS2 includes a newly formulated yellow ink that can produce prints with up to three years of outdoor durability without lamination. In addition, these new inks deliver virtually odorless printing without the need for external dryers, special ventilation or air purification systems, and do not contain Nickel (Ni) compounds, helping to reduce impact on the environment and potential harm to employees. * MicroPiezo TFP Print Head: One-inch wide, high performance print head with 720 nozzles per color capable of handling four separate ink channels; low vibration meniscus control provides highly accurate dot shape and placement and ink repelling coating dramatically reduces nozzle clogging. * Fast Print Speeds: Capable of up to 619 square feet per hour in draft mode with a recommended production speed of 205 square feet per hour for normal signage production. * Take in and Take-Up Reel System: Efficient take-up reel for unattended production of large print runs supporting both wind-in or wind-out; standard motorized heavy roll support system in the rear will support up to a 90 pound roll; optional high-capacity roll support available for heavy rolls up to 150 pounds. * Roll Media Loading: All new spindle-less design with manual EPSON LiftAssist allows for easy loading and unloading of heavy roll media. * High-Capacity Ink System: Individual ink cartridges up to 700 ml enable users to avoid production downtimes and maximize profitability. * Control Panel: New full color LCD panel provides easy access to menu items and printer controls. * Media Versatility: Given the unique form of solvent ink, EPSON UltraChrome GS2 works on virtually all standard coated or uncoated solvent media, including adhesive based vinyl and sign banner media; also prints on canvas media to produce fine art print. The EPSON SureColor S30670 will be available in April through authorized Epson Professional Imaging resellers for a list price of $16,995. The EPSON SureColor S30670 offers a standard EPSON Preferred(SM) Limited Warranty, a one-year program that includes toll-free advanced telephone access Monday through Friday and usually next business-day on-site service in the unlikely event of any hardware failure. Epson Preferred Plus service plans are available that cover both the hardware and software for up to two additional years. For additional information, visit www.proimaging.epson.com. The new SureColor S30670 will be shown at Graphics of the Americas from March 1-3 in Miami, Fla. (booth #377) and at the International Sign Expo from March 22-24 in Orlando, Fla. (booth #1547). Visit our web store for genuine and replacement Epson inkjet cartridges. Print your own Valentine's Day greeting cards! Thank You for your loyal support and all the new customers which you have referred to Priceless Ink & Toner over the years. 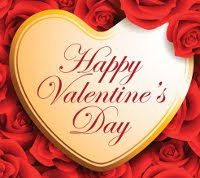 We also want to wish everyone a Very Special Valentine’s Day because it is a day that fills our Nation with a certain feeling of love for one another. We have a special present for you! You can download and print your own Valentine’s Day Card and send it to your special one! We offer our clients no Holiday Gimmicks or "Love Coupons", we offer our clients a real 20% discount everyday of the year when they select from our catalog of "environmentally friendly" alternative products. Simply open a free online Personal Page and the discounts are automatically applied during the Checkout process. We offer "Free Shipping" to every client that has opened a Personal Page to store their favorite products and take advantage of direct mobile notification and order confirmation. Our message today is simply we love to serve our wonderful "Priceless Customers" and will always do what is right to make their online shopping experience secure and completely worry free. Yes, our Staff Loves to Serve you! Visit our 2012 Valentine's Day free cards! Please share them with your friends! Bringing high-quality color printing and workgroup reliability to a larger base of business customers, Lexmark International, Inc. introduced the new robust, high-performing OfficeEdge Series of multifunction products (MFPs). These MFPs are built upon Lexmark’s new business inkjet platform and engineered with enterprise-caliber components to deliver the long-lasting, reliable performance of a laser with the color quality and affordability of an inkjet. A workhorse for small workgroups within the enterprise and small to medium-sized businesses (SMBs), Lexmark’s OfficeEdge Series includes two new models equipped with business-class features and laser-quality color printing at a 50 percent lower cost. The Lexmark OfficeEdge Series integrates seamlessly into most business IT environments, making them enterprise friendly for IT administrators tasked with implementing and overseeing the MFPs. Support for PCL and PostScript through the Lexmark Universal Print Driver increases enterprise compatibility, and monitoring and administering multiple devices from a central location are also simplified through the Embedded Web Server and award-winning fleet management tool Markvision Enterprise. The Lexmark Office Edge Pro5500 and OfficeEdge Pro4000 color MFPs are built for fast, professional, heavy-duty printing and scanning. The new additions to Lexmark’s lineup boast faster print speeds than most similarly priced color laser MFPs, up to 21 pages per minute (ppm) in black and 14 ppm in color, and the fastest time to first page compared to laser devices in its class means users spend less time waiting for a print job to complete. Additionally, the Lexmark OfficeEdge Pro5500 is highlighted by a single pass, duplex, automatic document feeder (ADF) with a capacity of up to 50 sheets to save users time by simultaneously scanning both sides of documents, while accommodating a variety of paper sizes up to 8.5 inches x 14 inches, a best-in-class feature. The impressive print quality makes a lasting impression with vivid colors, dark black text and higher resistance to water and smearing, made possible by Lexmark’s new pigment-based Vizix Pro ink formula. Utilized in both the standard and high-yield OfficeEdge Series ink cartridges, Vizix Pro produces color output with the crisp text quality of a laser printer and the brilliant color of an inkjet, allowing businesses to do more in-house printing and reduce costs. Made from plastic that contains post-consumer recycled content, the Lexmark OfficeEdge Series ink cartridges are eligible for the Lexmark Cartridge Collection Program (LCCP), which offers free, easy return options to recycle empty cartridges. The intuitive 4.3-inch color touch screen on the Lexmark OfficeEdge Pro5500 provides an easy to navigate menu and access to Lexmark’s productivity-enhancing SmartSolutions, downloadable software applications designed to help businesses save time and money by streamlining everyday tasks and common workflows. For even greater efficiency, Lexmark is introducing 12 new Multifunction Workflows that execute multiple tasks through the simple press of a button, such as "E-Mail & Save to Network" and "Copy, E-mail & Save to Computer". The new multifunction workflows for the Lexmark OfficeEdge Series will be available this quarter via Lexmark’s SmartSolutions site. Tablets, smartphones and cloud-based technology are changing the way SMBs and enterprises manage their day-to-day activities. For those on the go, moving between locations requires a greater need to access and produce documents anytime, anywhere with ease. Lexmark’s OfficeEdge Series is compatible with the Lexmark Mobile Printing App, which is designed for Android and Apple iOS smartphones and tablets, allowing users to print on demand from virtually anywhere. Visit our web store for Lexmark inkjet cartridges and Lexmark laser toner cartridges.